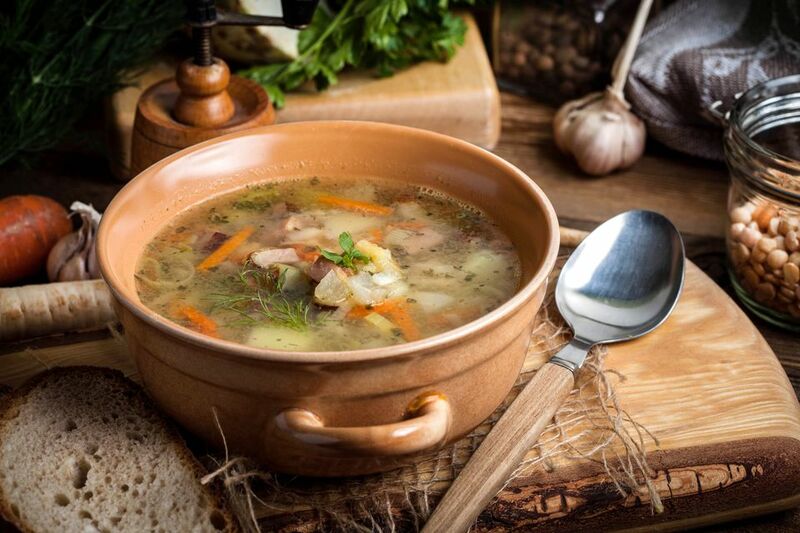 Like American split pea soup, Polish split pea soup (zupa ​grochowka) makes use of a leftover ham bone. This version differs slightly in that it's left chunky and potatoes, bacon, and carrots are added. Since ham is omnipresent on Polish tables, especially for major holidays, this soup is very common. If you can't make the soup right away, freeze the bone for when the spirit moves you. Serve with Polish rye bread and butter. In a large stock pot, fry bacon until fully cooked. Remove, crumble when cool and set aside. Add garlic, onion, celery, and carrots to bacon grease in the pot and saute over medium heat until limp. Add water, peas, ham bone, and bay leaf to pot with other vegetables. Bring to a boil, skimming any foam that rises to the top. Add the chopped ham, potatoes, crumbled bacon, and salt and pepper to taste, and return to a boil. Reduce to a simmer, cover and cook on low for 1 hour or until peas have completely broken down, stirring frequently to avoid scorching.